Yo, Lucille Mazzarella here. I'm getting ready for the family to come over for Sunday dinner. Well, Cousin Louis and Cousin Millie are already here living temporarily in our basement rec room on account of their house burned down. Cousin Louis took it into his head to heat up a can of soup, and next thing we knew, the whole place was in flames. The rest of the gang should be ringing the doorbell any minute now. It's a little early to start the pasta, but I know from experience that they'll all rush to the table and expect to find something hot to eat the minute they sit down. Today I'm making ziti--that's a kind of shape of pasta. Or macaroni as we used to call it. All this pasta talk is something new. I don't hold with putting no salt or oil in the water. The ziti will cook just fine without it if you ask me. And, this is important, your pasta never waits for your sauce--your sauce waits for your pasta. A friend from school, Elizabeth Powalski, once told me that her mother throws the spaghetti against the wall and when it sticks, it's done. Please! And don't go reading the directions on the box either. With pasta you've got to go with your gut. And you got to taste it. Fish a piece out of the boiling water--just be careful on account of that sucker is going to be real hot. Blow on it a bit and bite the end off. If it's just a little toothy still, your pasta is ready. Drain it and dump it into your bowl. I've had the same bowl for my pasta since me and Frankie got married, but that's me. I don't like change. Then you add your sauce but go easy please! You don't want your ziti drowning in sauce--just a nice, light coating will do. If someone wants more, let them ask for it. 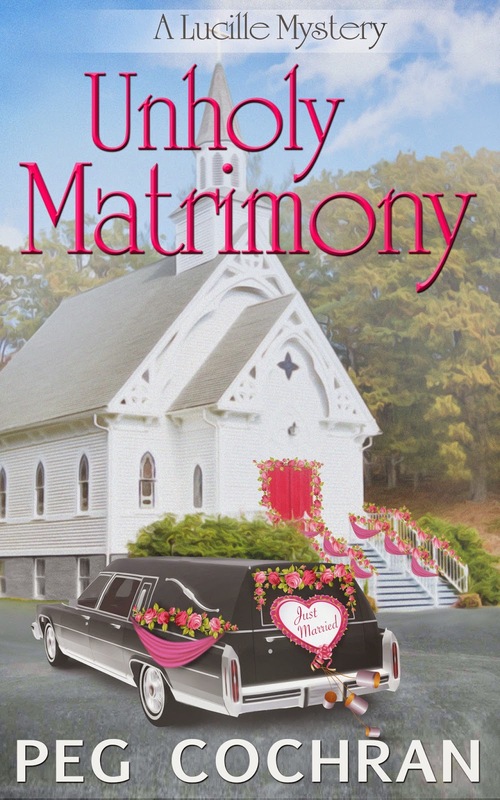 Read all about Lucille in Unholy Matrimony and the first in the series, Confession Is Murder. Available at Amazon, Barnes & Noble and Smashwords for all ebook platforms. "Toothy"? I don't think you mean it grows teeth. So...what do you mean? I think maybe Lucille means "toothsome" or slightly resistant when you bite it--al dente which means "to the tooth" in other words. Salt and oil? Depends on the day, i guess! I salt the water if I think it isn't boiling fast enough -- we live at 3200 feet -- or if I think salt will improve the recipe. Oil, not very often -- if the pot's big enough and you stir it, the pasta shouldn't stick. And yes, Peg's exactly right about "al dente"!